Brew is the younger brother of fellow Welsh international Nathan. Having played his way through the semi-professional ranks with Neath and Swansea, Brew signed for the Ospreys. 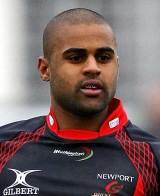 Brew found himself shipped out to the Newport Gwent Dragons on loan for the 2006-07 season. He returned to the Ospreys for the 2007-08 season but with the likes of Shane Williams ahead of him in the pecking order, he struggled to make an impact. But he had already played for Wales by this point having taken his international bow against Ireland in the 2007 Six Nations. He failed to make the 2007 World Cup squad. Brew then opted to join the Cardiff Blues in May 2008 but made just one appearance for the region. He opted to join Newport for the 2009-10 season and proved to be enough of a success to force his way back into the national reckoning. And after missing out on the 2011 Six Nations, Brew earned a cap against the Barbarians and was subsequently named in Warren Gatland's 30-man squad for the tournament.